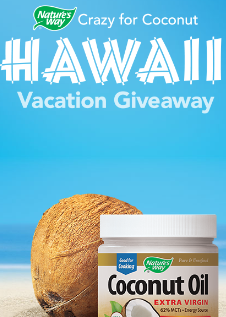 Nature’s Way Crazy for Coconut Hawaii Vacation Giveaway Sweepstakes & IWG – Win a trip to Maui! Win a trip for 2 to Maui! ENTER SWEEPSTAKES HERE – Nature’s Way Sweepstakes page. ENTRY LIMIT – There is a total limit of up to one (1) Game Play per day for visiting the Website and up to three (3) bonus Game Plays throughout the entire Promotion Period. ELIGIBILITY – The Promotion is offered only to legal residents of the 50 United States, the District of Columbia, and Puerto Rico who are at least 18 years of age at the time of entry. SWEEPSTAKES PERIOD – The Promotion begins at 12:00 PM (noon) Eastern Time (“ET”) on May 1, 2014 and ends at 11:59:59 PM ET on July 31, 2014. Grand Prize: The Grand Prize Winner will receive will receive a six (6) day/five (5) night trip for two (2) people – the Grand Prize Winner and one (1) “Guest” of his/her choosing – to the Travaasa Hana all-inclusive resort in Maui, Hawaii (“Grand Prize”). The Grand Prize includes round trip coach class airfare for the Grand Prize Winner and Guest between the major commercial airport closest to Grand Prize Winner’s residence and Maui, Hawaii (departure and arrival airports determined by Sponsor in its sole discretion); five (5) nights standard hotel accommodations (single room, double occupancy) in a Sea Ranch Cottage (subject to availability); airport transfers while in Maui, Hawaii; three (3) farm-to-table meals daily, all snacks and non-alcoholic beverages, and a $125 resort credit per person per day (six (6) resort credits per person in total). The ARV of the Grand Prize is $8,000.